Long regarded as heralds of change, eclipses are phenomena of great natural beauty and fascination, never failing to ensnare the imagination. 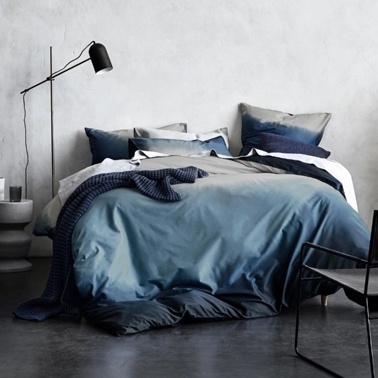 Coming to light here on an expanse of pure cotton sateen, in an overlapping spectrum of indigo, navy, eucalypt and sand. Eclipse is an expression of that same fleeting moment, a curiosity for the senses, where hues are blended and boundaries obscured. King Dimensions: 245 x 210cm. Composition Details: 360 Thread Count - Pure Cotton. Reverses to solid indigo. 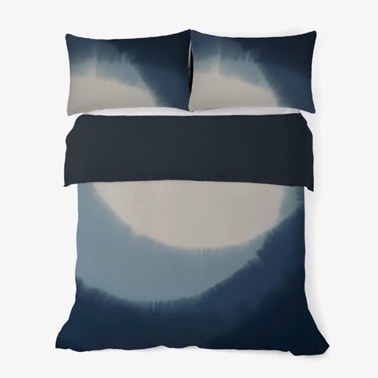 Duvet Cover Set includes: x1 Duvet Cover & 2x Standard Pillowcases. Cold machine wash. Wash separately before use. Do not bleach. Remove promptly after wash. Line dry inside out in the shade. Warm tumble dry. Warm iron if required. May be dry cleaned.